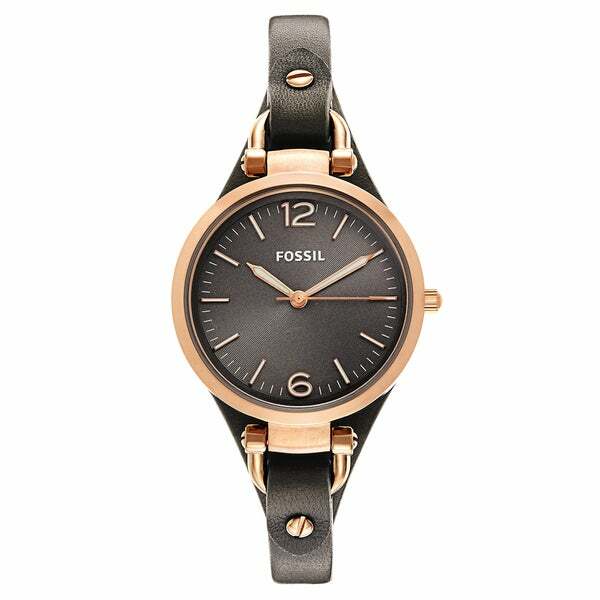 Wear this understated and elegant wristwatch from Fossil to bring classic sophistication to your day. Combining vintage charm with modern reliability, this timepiece makes a fitting accent to casual or dressy attire. Enjoy easy-to-wear comfort with security from the leather watchband and tang buckle. The rose-goldtone, fixed-bezel case and brown dial provide a simple warmth that matches any wardrobe. Be sure you're on time in any weather thanks to the quartz movement and easy-to-read three-hand analog display of this water-resistant wristwatch. Give this elegant timepiece as a gift, or keep it as a timeless embellishment to enhance your personal ensemble. Everything about this transaction went perfectly, as expected. I am very pleased with the watch; it has a second hand which I need and the large brown face is very easy to read. It's stylish and almost classic in appearance and goes well with my sporty outfits. Beautiful quality rose gold. supple leather. I have received many compliments on it, and was the best price on here. It was a Christmas present for myself, and it was great! My daughter left several choices of things she wanted for Christmas. I shopped at different online sites for this watch. Overstock was the best for price, shipping, the whole ball of wax. The watch came in plenty of time for Christmas, making me look good and getting her what she wanted. Thanx. This is a great watch! It is a beautiful rose gold color and with dark face background, I can see the time without my glasses! It is very pretty on. I bought this watch as a Christmas gift, but it was so cute, I was tempted to keep it for myself. I think my daughter will love it! I am completely in love with this watch. I think it is hard to find a feminine watch and this one is! Gave this as a gift to my girlfriend and she absolutely loved it! Looks real nice , very pleased . Bought it for my daughters birthday and she liked it immediately, now I’m getting one for my dog and maybe my cat . This was a replacement watch for same type. Great prices on Fossil watches. Love the selection. Perfect color and look. I love this watch. The quality is also good. I have had it now for 2 years, still working great. Love this watch and get so many compliments. Excellent quality for my everyday watch. "What color is the band of this watch?" "Hello, could you please tell me what color the band is for this watch? The description is not clear. I am hoping to get one of the smoke-colored bands. Thank you very much, Deb Baldwin"
"I have bought about five watches, all with either the battery dead or almost dead, running slow, then dead within a short time. I need a reliable watch whose battery will be strong and last. Do I have to settle for a Timex instead of fashion?" My magic 8 ball says probably....although I have owned this watch for several months and the battery is still working. Let's start a trend and make Timex a fashion statement! You should always go for durability over fashion!! because this is a nice well known brand and have always wanted a fossil. the price was good so I decided to buy.